Three! Challenging> Requires that you pay attention! - Dishin with Rebelle I had the privilege of reviewing one of the latest Apple apps Tic Tac Mo! It is like regular Tic Tac Toe but with a twist. You can play single, double or triple. The board is not like a regular tic tac toe board. 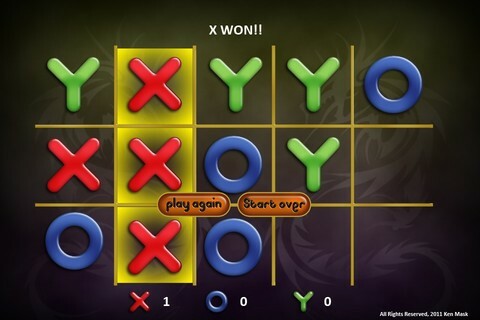 - Tic Tac Mo app review If you’ve ever played the classic game of Xs and Os, you’ll be familiar with the familiar game play with nine squares. In this version, you get 15 squares and there are three players: X, Y, and O. As usual, each player takes his or her turn and places the symbol on the grid. The first person to get a row of three wins. - Tic Tac Mo for iPhone is the classic Tic Tac Toe game with new features Tic Tac mo has a traditional game board, the game organized as 5 by 3 to account for the extra player. The first player to achieve three symbols in a row is the winner. Players can also view number of wins. 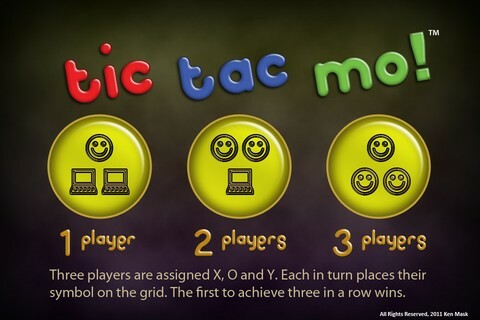 - Tic Tac Mo - A Classic Game App The app is a revolutionary version of TicTacToe but you play Tic Tac Mo with Three! Three players are assigned X, O and Y. Each in turn places their symbol in an empty square on the grid. The first to achieve three in a row wins! - Tic Tac Mo – iOS Game Review What is the one game everyone seems to know how to play? Tic Tac Toe of course! I do not know how many times I have played (and lost) but it is a lot. Well there is a new game on the market, called Tic Tac Mo! which puts a new twist on the old classic. - Tic Tac Mo Play Tic Tac Toe with three! Three players are assigned X, O and Y. Each in turn places their symbol in an empty square on the grid. The first to achieve three in a row wins! One versus the computer, two versus the computer or three people against each other. This revolutionary version of the classic game will be a favorite for many years to come. Seller: Tic Tac Mo, Inc. via Apple, Google Play, play global launch available at selected auto dealers, medical centers, schools, restaurants game-play consoles. TM and © 2019. Ken Mask.